Birth defects, premature births, endocrine disruption, cancer, Parkinson’s—why are we doing this to our kids? Action Alert! We are directly poisoning our children in many ways. This article will highlight recent research on just two of them. According to a new study published in the journal Endocrinology, oil and natural gas operations are contaminating surface and ground water with chemicals that wreak havoc on birth and growth hormones. Other recent reports show toxic levels of selenium contamination in the groundwater near fracking operations. This is leading to premature births. The fracking study found that twenty-three commonly used fracking chemicals “can activate or inhibit the estrogen, androgen, glucocorticoid, progesterone, and/or thyroid receptors, and mixtures of these chemicals can behave synergistically, additively, or antagonistically in vitro.” The chemicals caused decreased sperm counts and increased body, heart, and thymus weights, which means the chemicals attack multiple organ systems at once. The potential adverse developmental and reproductive health effects on humans could be devastating. There is already evidence this is happening. Living near fracking operations is associated with pre-term births. In a study of 10,496 births from 2009 to 2013 in Pennsylvania, where fracking is conducted, scientists found that 25% of mothers who were exposed to fracking the most were 40% more likely to give birth prematurely. Let’s not forget that organic produce in California may be contaminated with repurposed fracking water. Unfortunately, exposure to fracking chemicals is only the tip of the iceberg when it comes to the federal government caving to Big Food, Big Pharma, and Big Oil and relying on their biased studies to set policy. Nowhere is this more apparent than Hawaii, the “ground zero for experimentation with GE crops” according to a recent report by the Center for Food Safety (CFS). Hawaii contains more than a thousand test-field plots for GMO crops—more than any other state, and glyphosate (Monsanto’s Roundup herbicide) is used in abundance. Biotech companies, taking advantage of Hawaii’s extended growing season, sprayed seventeen times more restricted-use pesticides on just one of Hawaii’s islands than on typical cornfields on the US mainland. Between 2007 and 2012, DuPont-Pioneer alone sprayed 90 different pesticide formulations containing 63 active ingredients on two-thirds of the days each year on Hawaii’s Kauai island. 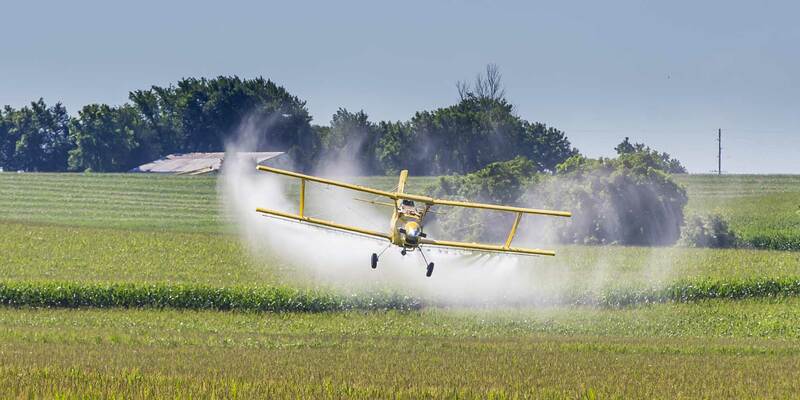 Pesticide ingredients have been linked to a wide spectrum of nasty health effects including non-Hodgkin’s lymphoma, bladder and colon cancer, Parkinson’s Disease, depression, and hormone disruption, to name just a few. In Hawaii, glyphosate is now causing birth defects at ten times the national rate. Your eyes and lungs hurt, you feel dizzy and nauseous. It’s awful. Here, 10% of the students get Special Ed services, but the state average is 6.3%. It’s hard to think the pesticides don’t play a role. Epidemiological evidence shows how dangerous pesticide drift can be. One study, for instance, found that expectant mothers living within 500 meters of fields sprayed with organochlorine insecticides during early pregnancy were six times more likely to bear children with autism. Although Hawaii is an extreme example, the issue goes far beyond just one state. In fact, 3,200 elementary schools and 12,000 churches in the 48 contiguous states are located near fields where GMO corn and soybeans are likely grown. One can only imagine the effects of decades of exposure to pesticide drift on these communities. Fracking fluid is in our water, soil, and food. Pesticides and herbicides are on our food, in the air, and in our homes. None of this is all that surprising when we consider that the Environmental Protection Agency (EPA) relies almost entirely on industry-funded science when it evaluates these chemicals for safety. When the EPA does evaluate a pesticide or herbicide, the agency only evaluates the active ingredient in isolation, even though people in the real world are exposed to multiple pesticides at once that can have additive and synergistic effects. Only a strong response from the public can have a chance at getting the federal government to put the safety of its citizens first. Action Alert! Write to the EPA and urge them to revoke their approval of glyphosate; consider pesticide drift as they continue to evaluate pesticides and herbicides for safety; and require independent analysis of the incredibly toxic chemicals being used in fracking. Please send your message immediately.